Union Bridge is located in the heart of the Piedmont Plateau. 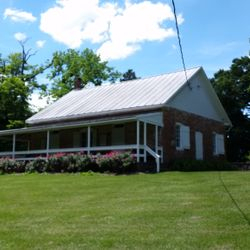 The gently rolling terrain offers outstanding rural scenes at every turn in the road. Settled as a farming community before the Revolutionary War, land was purchased and the settlement founded by the Farquhar family of Pennsylvania from John Tredane in 1731. As the settlement began to grow, it was named Buttersburg. 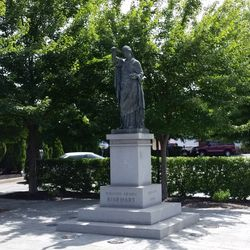 Many of the shade trees to be found in the town today are descendants of the two sugar maples brought from Brownsville, Pennsylvania by Mrs. Elizabeth Farquhar Wright. The postal service renamed the town to commemorate the bridge that spanned Little Pipe Creek to unite the north and south sides of the settlement by calling the community "Union Bridge". Union Bridge was chartered by the Maryland General Assembly on May 2, 1872. 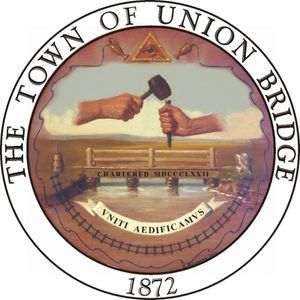 While Union Bridge has grown slowly over the years, it has a proud heritage. It's largest growth spurt happened in 1862 when the Western Maryland Railroad came to town. Since then, the population has remained at around 1000 people. Which shall the bridge, town, name, and seal outlast. Humanity, in hand and heart and mind. 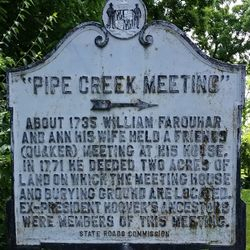 The "Pipe Creek Meeting" was first held in 1735 in the home of William Farquhar. He later deeded land for the meeting house and burial grounds in 1771 and construction was completed in 1772. 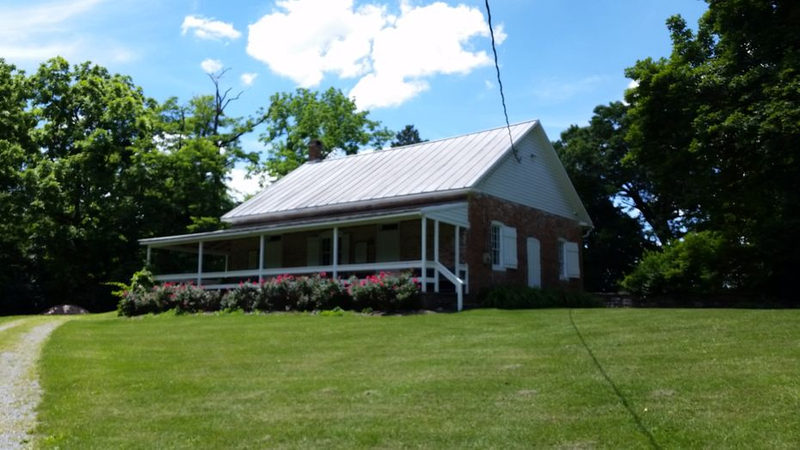 In 1929, President Hoover attended a Friends Meeting with his family during his travels through Carroll County. His great-grandfather was a member of the Friends Meeting. 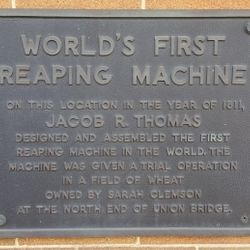 In 1811, Jacob R. Thomas designed and assembled the world’s first reaping machine in Union Bridge. 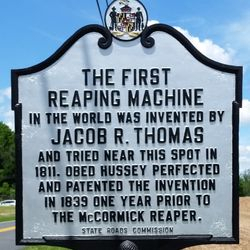 Though it didn't work as designed, it inspired his cousin, Obed R. Hussy to perfect and patent the reaper in 1835, one year before the McCormick Reaper. 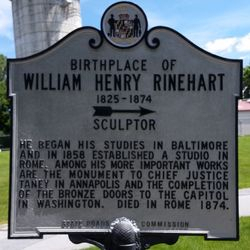 Noted sculptor, William Rinehart was born here in September of of 1825. After the age of 18, he began working on his fathers farm and also apprenticed at a local stone-cutter. He then went to Baltimore to study art and sculpture. Eventually he began to create marble sculptures and soon moved to Rome, Italy where he continued to study and produce beautiful works of art. His works can be found all across the world including Washington, D.C., Baltimore and Rome, Italy. 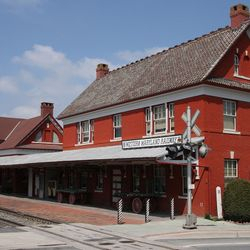 The Western Maryland Railroad shops and offices were located here beginning in 1862. It became the main headquarters and shops for the railroad and many innovations were spawned including the invention of the knuckle railroad coupler. The first passenger trains began operating from Union Bridge to Baltimore in 1862 as well. 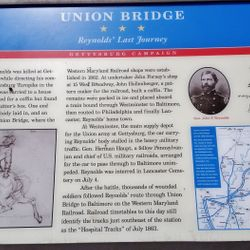 During the Battle of Gettysburg, Union General John F. Reynolds was killed (first general killed during the battle) and was eventually brought to Union Bridge to be taken to Baltimore. While here, a proper casket was built for him and he was packaged in ice for the trip to his home town of Lancaster. After the battle, thousands of wounded soldiers were brought to Union Bridge for transport to Baltimore; and to this day, this section of railway is known as the "Hospital Tracks" of July, 1863. In other notable areas, Union Bridge was the first small town (municipality) to have electric street lights in Maryland. The electricity was produced by a new electric company that was located at the intersection of N. Whyte Street and Elger Street. 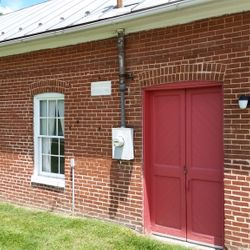 Though not the same building, a building that was used as the electric company still stands on this property today. In 1868, a major fire occurred at the Western Maryland Railroad Yards. Nearly every building was burned to the ground. It was then, that the town's people decided they needed a fire company. 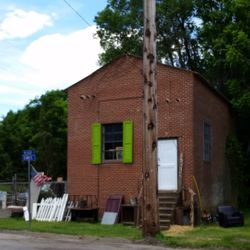 Initially, leather buckets, hooks and ladders were purchased and kept in one of the sheds at the rail yard. 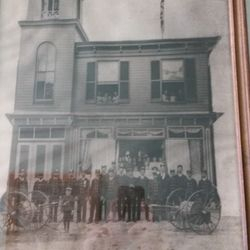 It is not known if an actual organization was created, but finally, in 1887, 30 men pledged to organize the Union Bridge Fire Company, Incorporated. 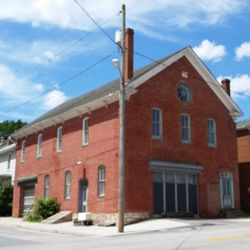 The first firehouse was a converted hardware store (Donated by William Wood) on Main Street next to the bank. Annually, at the end of May and the beginning of June, the men and their wives held a festival to financially support the fire company. To this day, the fire company starts its annual Firemen's Carnival during what has become Memorial Day, the last Monday of May. Today, the town’s leading industry is the Lehigh Hanson (Heidelburg Group) Cement Company which has employed a large portion of the towns people for decades. In the early 1900's, vast deposits of limestone (primary ingredient in cement) were found at the edge of town. The Tidewater Portland Cement Company built a plant and began mining and producing cement in 1909. Though the original quarry is under water, another quarry was created that is still in use today. In 2017, another new quarry in New Windsor has opened to help supply the manufacturer with the raw material needed to make cement. Located on Quaker Hill Road. Located on Bucher John Rd at the edge of town. Located at the intersection of Ladiesburg Rd and Quaker Hill Rd. First built as the town hall, became the Union Bridge Fire Hall and was used from 1925 to 1967. Corner of E. Broadway and Benedum St.
First Fire Hall on Main St. 1887 to 1925. Located where the current bank entrance is now. This information board is at the Western MD Rail Museum. 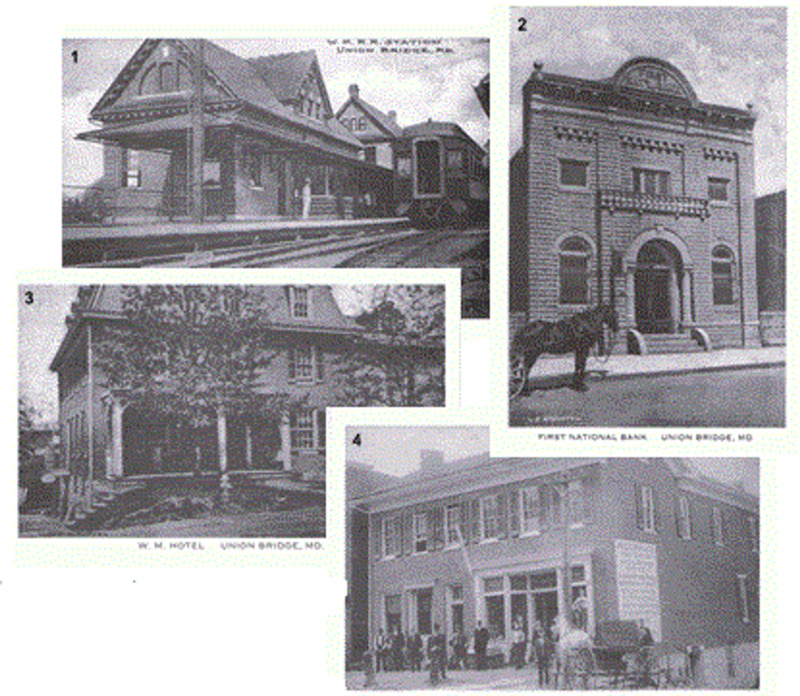 The offices and train depot (Union Bridge Station) for the Western Maryland Railroad. 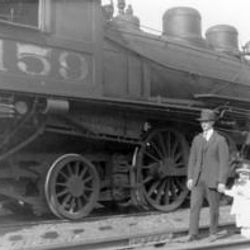 Locomotive #159 at the Union Bridge rail yard. The first town well and pumphouse (Union Bridge Water Company). Located at the Town Hall.